High seas adventure cinema par excellence. Three big screen versions of this story have been made and there’s no doubt this version is the best. Five Academy Awards nominations including a winner for best picture doesn't lie, but watching Clark Gable in his prime squaring off against Charles Laughton is undeniably powerful and exciting cinema. It's 1789, the Fletcher Christian (Gable), is scouring the port for sailors and midshipmen to pilot the HMS Bounty, a King's ship assigned to a mission to Tahiti. 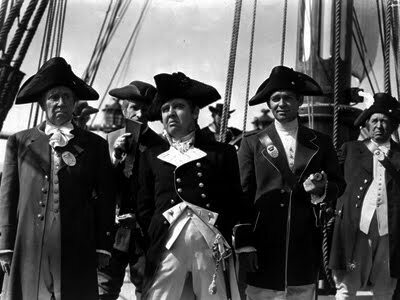 It's two year expedition, a lengthy journey which frightens some, but it's the Captain, William Bligh (Laughton) who strikes the fear of God in the men. Bligh lives by the code of leadership by fear. Fear of the brutal punishment which Bligh continually inflicts on his men. Whether it's whipping with a cat 'o' nine tails or keel hauling, the crew take beating after beating. Christian watches in horror but knows Bligh's orders are condoned by the laws of the King. After arriving at Tahiti and enjoying three months of tropical bliss, once back on the ship Christian just can't take it anymore and fights back against Bligh, engineering the most famous mutiny in sailing history. Charles Laughton and Clark Gable are a terrific match. Two of the great adversaries ever on film. One American, arguably the biggest star in the world, and the other one of Britain's best actors. Though Laughton is shorter and considerably less handsome, he is an imposing presence on screen. It’s interesting to note Clark Gable using his usual American accent to play a Briton. Strangely it doesn’t matter. All it takes is Gable’s personification of honour and poise which makes him believable as an upper classman of Britain. It was a big production then and even 80+ years later the production value is still stunning and realistic. The castoff scene for instance which launches the Bounty is staged magnificently by director Lloyd, full of epic grandeur. If anything many of the Tahiti scenes, shot on a sound stage with rear projected palm trees, look fake and betrays the realism of the sailing sequences. But in all versions of the story, and this one included, the weakest moments all seem to be the Tahiti sequences wherein the crew of the Bounty make stay on the island for 3 months collecting fruit, sunbathing in skimpy bathing suits, bedding the native women and in general living high on the hog. While this sequence in this picture is unabashedly sentimental and conflict free the period of rest is necessary for the audience. For when the crew eventually gets back on the ship and into the cauldron of punishment from the Captain it seems even more intense and cruel. And thus, the eventual Mutiny in the second half becomes even more cathartic. The fact is when Bligh and Christian are on board together at sea, it’s a cinematic dynamo of tension and conflict. The actual mutiny scene seems to come as an afterthought, and based on the intense build up, the scene is, if anything, under whelming. Despite the faults of the 1962 version, the calmer more reluctant muniteer as portrayed by Brando and under the direction of Lewis Milestone executes his mutiny with more panache , but at nearly 3 hours, it's simply too long to hold our attention before this scene. At 130 mins, the 1935 version seems just right.